I also wanted two mountains. But L = 30 is too long. Because it is a standard, I guess it's useless. It is cheap, but it is saved if it is a bit cheaper. This review is about item#5530813. I think that it is quality good product. The number in one pack is also appropriate amount and it is very easy to purchase. I am happy that there are more variations in length. This review is about item#05530777. I am saved because the lengths are complete. It is safe to build firmly. This review is about item#5530734. It was good that I could choose the size and buy it in a small pack. This review is about item#5530822. 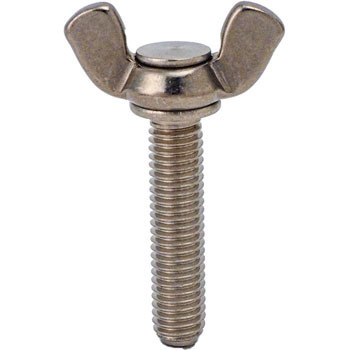 M6 stainless steel bolt is indispensable material for installation of a parabolic antenna. Butterfly bolt 12 mm long / 15 mm long is ideal for parabolic antenna elevation setting. It is the greatest benefit for amateurs to be able to respond with bare hands, with no bare hands. Many people hesitate only because they are expensive items, but if you start using it, you can not afford anymore. This review is about item#5530786. It was solid and necessary strength and appearance were also beautiful and good. This review is about item#05530883. This review is about item#05530865. The surface was not a little beautiful. This review is about item#05530847. This review is about item#05530795. As a machine part for food production. It was able to be used without problems. I also like stainless steel. This review is about item#05530917.